The Southern Illinois Salukis men's basketball team went pink on Tuesday, Feb. 18, as they faced the Bradley University Braves. Here are some selects! Salukis guard Desmar Jackson dunks the ball. Salukis guard Jalen Pendleton holds onto the ball while being triple teamed. Salukis guard Tyler Smithpeters celebrates with teammates on the bench after hitting a three point shot. Salukis guard Desmar Jackson is helped up after getting fouled. 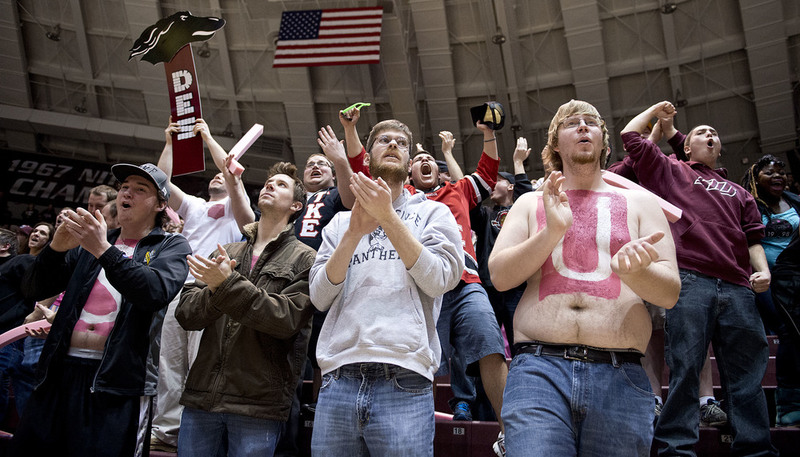 Saluki fans cheer during the final seconds of the game. SIU won 75-64 and it has gave them the sixth seed in the Missouri Valley Conference.